We are pleased to welcome back Sarah Pulliam Bailey with this guest post! These would be great for you weekend and summer picnicking! Chocolate chip cookies provide the ultimate comfort food. 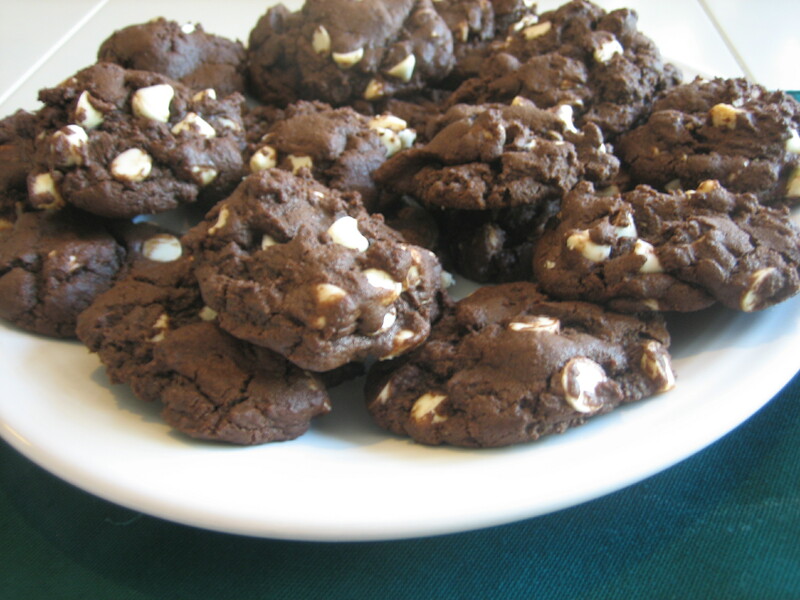 If you’re serving chocoholics, consider baking double chocolate chip cookies, which offers a rich, moist, chewy dessert. The cookies did not turn out terribly even because I was in a hurry and grabbed rounded spoonfuls of dough, which made them puffier. If you prefer more uniform, flattened cookies, you could roll the dough up on parchment paper in a log, refrigerate for two hours, and cut individual cookies. You could also substitute white chocolate chips for peanut butter chips and chopped peanuts. Some of the reviews suggested using 1 tsp. of baking soda and 1 tsp. of baking powder, so consider experimenting. The recipe takes about 30 minutes and makes about 3 dozen cookies. Preheat oven to 350 degrees F. Grease cookie sheets. In a large bowl (I used my KitchenAid), cream together the butter, brown sugar and white sugar. Add the eggs one at a time, beating each one well. In a separate bowl, whisk together the cocoa, flour, baking soda, and salt. Gradually stir the mixture into the other bowl. Fold in white chocolate chips. Drop rounded spoonfuls onto the cookie sheets. Bake for 8 to 10 minutes (9 minutes was perfect in my oven). Allow cookies to cool on baking sheets for 5 minutes before removing to a wire rack to finish cooling. If you have a smaller kitchen, consider investing in a tiered cooling rack.